The Chelodina longicollis is a widely distributed long necked species that inhabits a wide variety of water bodies and is an opportunistic feeder. 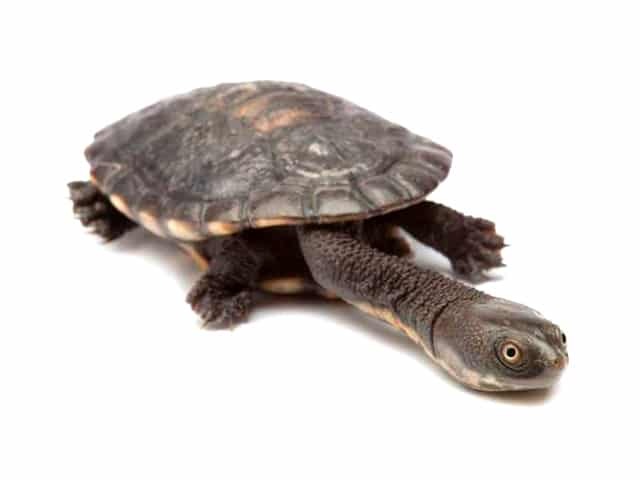 It is a side-necked turtle, meaning that it bends its head sideways into its shell rather than pulling it directly back. The carapace is generally black in color though some may be brown, it is broad and flattened with a deep medial groove. The scutes are edged in black in those individuals with a lighter background color. The neck is long and narrow and reaches a length of approximately 60% of the carapace length. For keeping your small turtle indoors, you need a fish tank or aquarium of at least 0.9 meters (3 feet) size. A 1.2 meters (4 feet) tank is better especially if you have bought 2 turtles. Don’t use any glass lids or a hood on the tank (they cause an increase in humidity). Ideally the tank’s filtration system will have been running for 2 weeks prior to adding a turtle. The tank should have a floating turtle dock so the turtle can get out of the water, dry off and bask under a heat lamp. Preferably don’t use a fixed dock; it will limit the volume of water you can use. The tank should also have a good quality large external canister filter (not an internal type of filter) should also. No turtle will stay small, they all grow. When your turtle gets to about 0.15 meters (0.5 feet) in shell length it is really better off in a 6’ tank, or better still in an outdoor pond. For the outdoor pond there is separate section on the next page. It’s recommended to add water plants inside the aquarium so that the turtles can hide in and feel safe and also be able to rest on them. Outdoor ponds can be in ground, above ground or partly in ground and partly above. In ground is preferable for reasons of insulation from heat and cold, although an above ground pond on concrete can be insulated to some extent by placing it on a bed of polystyrene. Alternately, a free-form in ground pond with rubber lining can be made to look very attractive and natural, resembling a turtle’s natural habitat. Whichever way you go, bigger is better and try to make it at least 0.3-0.4 meters (1 – 1.2 feet) deep so that the water temperature will not be so easily affected by the air temperature. The outdoor pond should have basic setup in order to be functional. Firstly a good pump with a good filtration system and oxygenation, possibly with an Ultra Violet Clarifier (UVC). It should be place in a sunny position that gets shade also. Make sure to provide a land area beside the pond and above the water line with sandy soil and plants that provide shade. Add some water plants in the water to provide cover and a covered area with sand and leaf litter where they can hibernate. If the pond is smooth sided, a ramp or smooth rocks placed so they can climb out to bask and make sure the pond is surrounded by fencing about 50cm high and extending below ground 0.15 meters (0.5 feet) or a secure yard. Add some live feeder fish in the pond and try to make it as big and as natural as possible. Examples of outdoor ponds can be found here. We recommend to us Calgrit (crushed limestone) as a substrate. You won’t be able to get that Aquarium Shops, however you can buy it from produce stores. Don’t use gravel or small pebbles as it can be ingested and cause a fatality. Larger pebbles can be dislodged and trap a turtle causing it to drown. Calgrit is safe for the turtle even if ingested and will also keep the ph of the water stable. The heat lamp can be an ordinary clip on bedside lamp with a 40 or 60w incandescent globe. A halogen globe will also give off heat and do the job. The air temperature above the dock should be several degrees warmer than the water temperature (approx 30 °C (86 °F)). Water heater with guard, set to about 24-26 °C (75-78 °F) for most commonly kept species. Provide a fish tank fluorescent type light fitting with UV tube (5% or preferably 10% UVB), positioned close to the water and without glass lids in between. The UV tube will need replacement every 6 months. Timer to control the lights and give a day/ night cycle and make sure that an aquarium thermometer is installed in order to check the actual temperature. There is no substitute for natural sunshine, even with your UV tube above the tank. Give them time in the sun at least twice a week for about 20 minutes. Put them in a tub (no water) that is partly in the sun and partly in the shade, so they can regulate their body temperature. Keep an eye on them. Plenty of water, although for hatchlings start off with shallow water 0.10 meter (0.3 feet) deep. If using tap water de-chlorinate it first. Add aquarium or pool salt. 5 grams per 10 litres of water, it will help prevent infections. pH of 7 to 8 is preferred. A natural diet such as the turtle would find in the rivers or dams is always the best. Therefore, uncooked fresh water fish, fresh water prawns, yabbies, bloodworms, brine shrimp, and fresh water snails. NO white meat, no red meat, no vegetables. Whitebait is suitable if soaked for a few hours to remove the salt. Likewise salt water prawns, but they should also have the head and tails removed. Leave the shell on. Fresh is always better than frozen, and freshwater fish are better than salt water fish. Insects like crickets are ok. Turtle pellets are ok, including Hikari Cichlid Gold, which is actually for fish but has vitamins etc that turtles need also. Vary the diet; don’t get the turtle stuck on one food alone. Feed a small turtle once a day an amount equal to the size of their head. When they get to 10cm shell length you can feed them every second day. Don’t over feed your turtle, despite it seemingly being hungry. You will only be “killing it with kindness” as it will grow too big too fast, get fat and have associated health issues including a shortened life span. Avoid the frozen turtle dinners from pet stores unless the contents are fish products, even then use sparingly as part of a whole varied diet. Add feeder fish to stimulate their natural hunting instincts and provide a potential food source. Let your turtle settle in to the new environment, don’t play with it, you will only stress it, stress can cause health issues. Try to handle your turtle as less as possible. It’s recommended in addition with the filtration of the aquarium to do additional partial water changes (a bucket full or two of water) every week in order to keep the aquarium clean. Keeping your aquarium equipment and decoration safe will prevent accidental drowning and situations of turtles getting scratched. If a cut goes untreated it might lead to shell infection or even shell rot. Making sure that there is enough provision of calcium and sunlight will avoid situations of soft shell. Dirty water or incorrect pH can result bacterial infections or swollen eyes and sometimes even skin infection. Respiratory infection will occur if turtles are kept in continuously cold or draughty conditions.